There are few places left on the planet where you can visit an untouched wilderness. Berkeley River, on the far northwest coast of Western Australia is one. 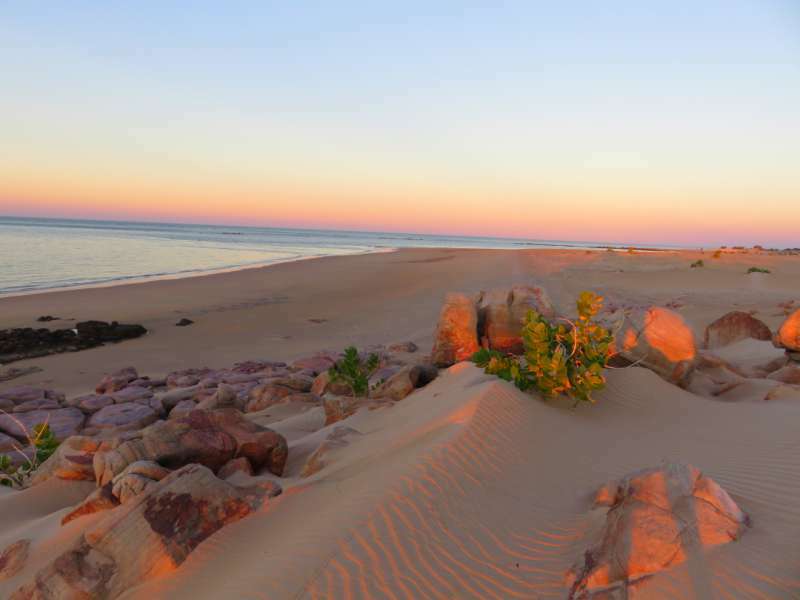 Beyond the outback, the landscape stretches from one horizon to the other without a single sign of human habitation save Berkeley River Lodge - and perhaps a lone sailor sheltering for the night in the safety of the river mouth. Access is by light plane from Darwin or Kununurra and supplies arrive by barge. There are no roads in or out. 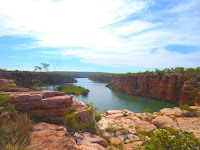 We came to the Kimberley region for the stunning scenery and the isolation. At Berkeley River Lodge we got both. With individual villas dotted along the cliff top, looking out either across the vast expanse of the Timor Sea or toward the magnificent gorges of the Berkeley River, we felt like we had the world to ourselves. The gorge at Berkeley River. On our first full day we joined a dozen or so other guests on a river cruise to Casuarina Falls. 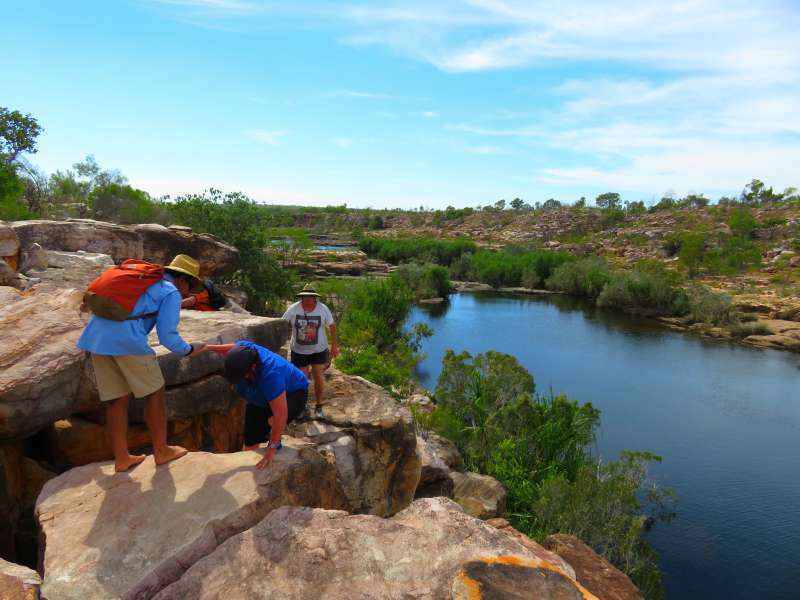 This is crocodile country and Matt, our guide, warned us to be on the look out for saltwater crocs sunning themselves on the rocks or waiting for their next meal in the camouflage of the river-bank vegetation. We didn’t have to wait long for our first sight of one of these prehistoric monsters. Then we saw another and another and another - six in all by the end of the cruise. This saltwater monster was hidden in the mangroves near the river. 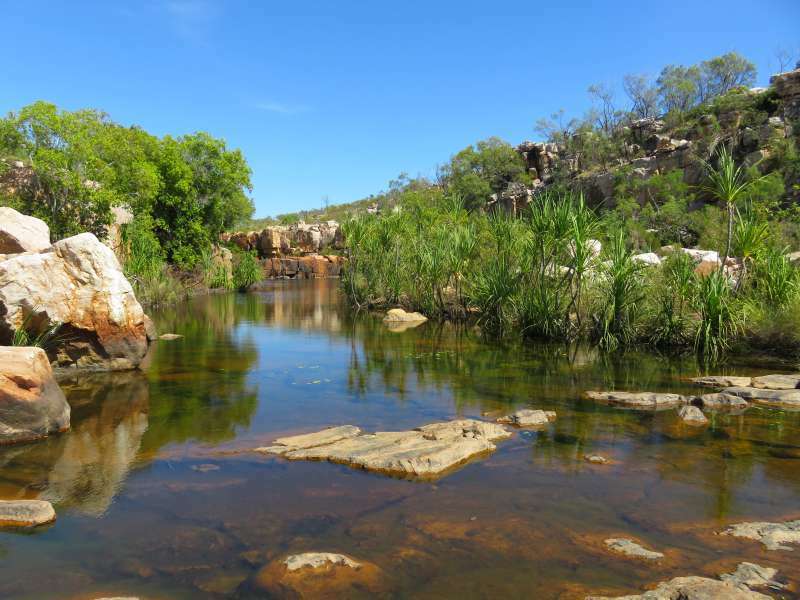 As the mangrove-lined banks began to give way to red-rock gorges, Matt pulled into the side of the river and we clambered out to explore the rock pools and rivulets. The rock pools were beautiful and blissfully crocodile-free. Back in the boat we entered a series of gorges with orange-red sandstone cliffs towering above us on both sides. 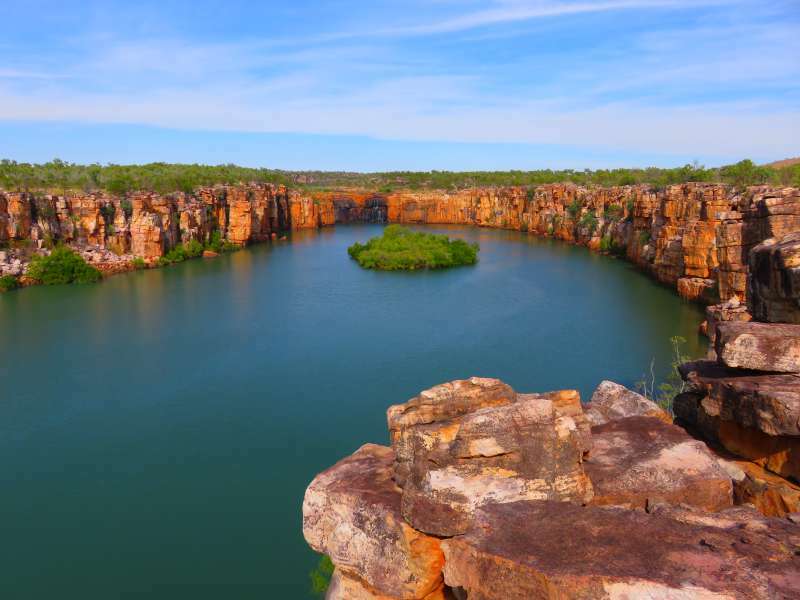 This was the Kimberley region I had come to see and I wasn’t disappointed. We travelled up the river to Casuarina Falls as far as a boat can navigate, before pulling in for a picnic lunch on the natural seats of a rock ledge. On our second full day we set out with a smaller group to explore Berkeley Creek. The creek runs along a plateau at the top of the gorge. To reach it we had to climb over rocks up a steeply sloping cliff face. It wasn’t especially difficult but I wouldn’t want to attempt it without a moderate level of fitness and a reasonable head for heights. Once at the top we were able to stand at the very edge of the rock face forming one side of the gorge. The view was breathtaking. Our guide, Bruce, who had spent much of his life living in and exploring this part of the Kimberley Coast, led us upstream along the creek. From time to time there were rock pools large enough for us to cool off with a short swim. 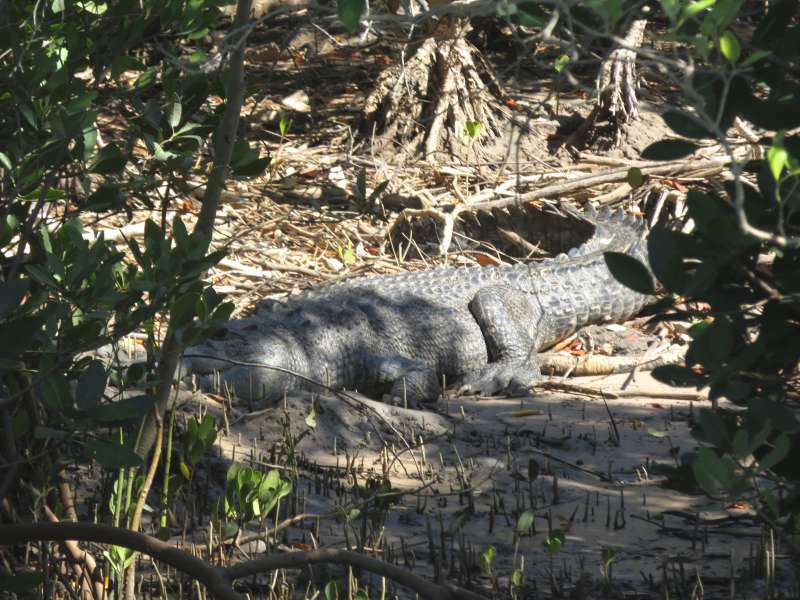 Crocodiles don’t climb, so we were safe from the prospect of becoming reptile lunch. Some of our group negotiating a tricky section on the Berkeley Creek walk. We also came across several examples of ancient Bradshaw rock art. Named after Joseph Bradshaw who first discovered it in 1891 and found only in the Kimberley region of Western Australia, little is known about its origins. It may have been created by the ancestors of today’s aborigines, however the elaborately ornamented figures it depicts bear little resemblance to modern Australian aborigines, leading to the theory that it was created by another race of people entirely. 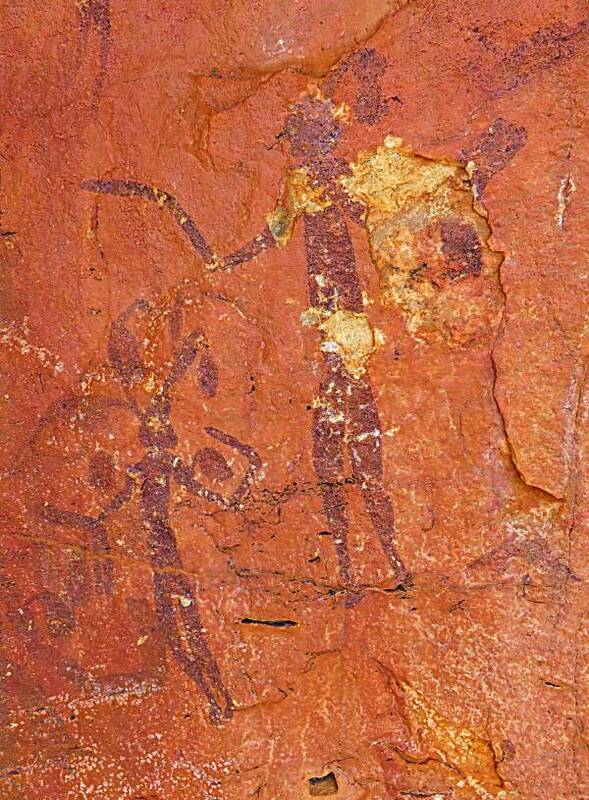 If Bradshaw Art does pre-date modern aborigines then it may be some of the earliest rock art on earth. At 4 pm on our first evening a beach drive left the lodge to take in the sunset with drinks and nibbles. On the way Matt kept up a running commentary on the local area. It was lots of fun and a great opportunity to catch the scenery in the soft late afternoon light. I took this on the beach drive with my little point and shoot. I thought it came out pretty well given that I don't pretend to be a photographer. As well as the River Cruise, Creek Walk and Beach Drive there were also fishing tours and helicopter sightseeing flights. Other guests spoke highly of them. Three of the villas. Villa 20 is on the right hand side. 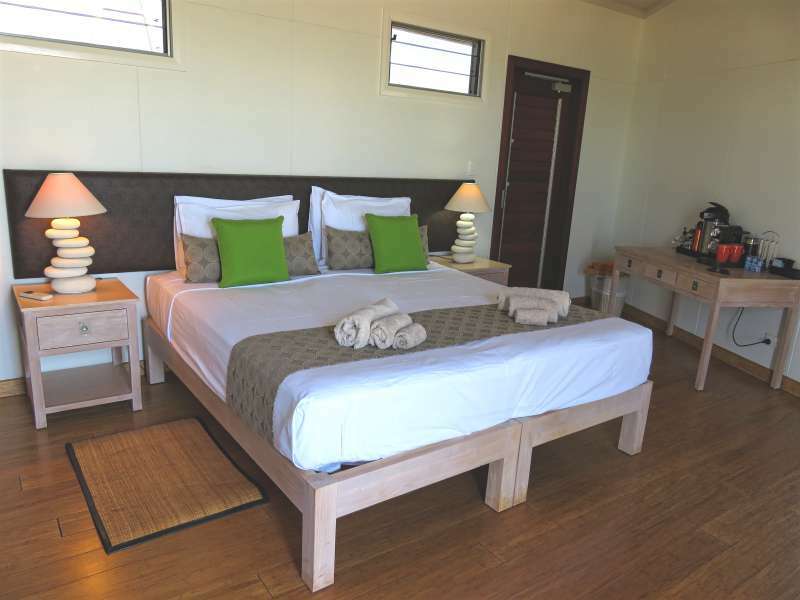 The rooms at Berkeley River Lodge consist of self-contained villas. While those further away from the main lodge have more privacy than those close to the lodge, none have a view which is less than breathtaking. About half the villas look out across the ocean and half look toward the Berkeley River. We stayed in Villa 20 which was furthest from the lodge. The disadvantage of this was that we had a long, dark walk after dinner each night along the resort’s unlit red dirt road. The first night we managed to get lost but fortunately found our way again fairly quickly. The torch we discovered in our room was essential - but my little black pumps will never be the same again! The advantage was the glorious sunsets we got by being angled more to the west than the other villas, although the westerly aspect made the terrace quite hot in the afternoons. The inside of our villa. Villa 20 also has an interesting bathroom. The other villas all have outside showers, toilets and baths open to the elements on top but encircled by rough brushwood fencing. The fencing in Villa 20 is open to the elements above and from about waist height on one side. This is the room to ask for if you have a yearning to feel like you are camping but don’t want to swap the luxury of a hotel room for an actual tent. I loved it. David found it just weird! Our open air bathroom - the shower is on the left, out of the shot. The food, particularly at dinner was a little disappointing. 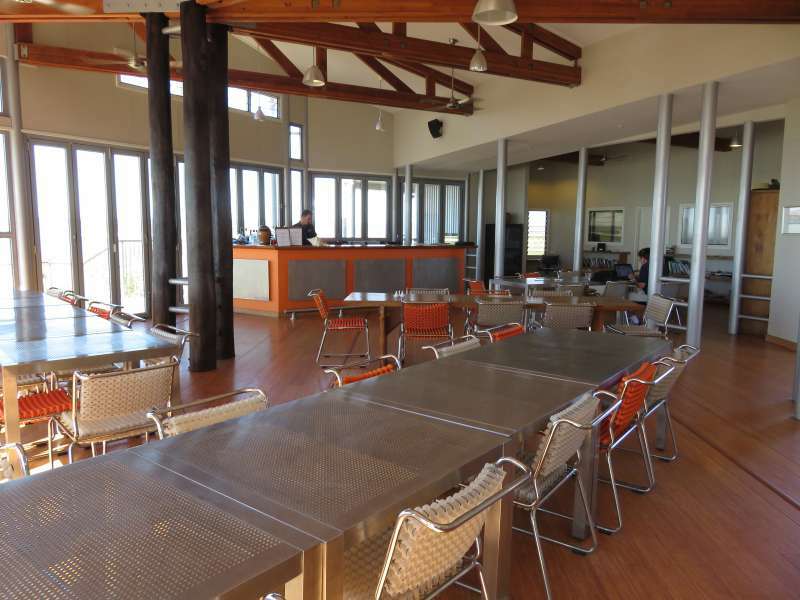 All 40 guests eat together at communal tables, each seating about eight to twelve people. Everyone is served the same meal except those who specifically request something different. David asked for seafood and was given wild barramundi each night. The menus were unimaginative and not of the high standard we have experienced in other luxury resorts in Australia, but the main problem was the noise of 40 guests all sitting down to dinner at the same time. Without any soft furnishings to deaden the sound and with the doors and windows closed to keep out the wind and evening chill, the dining room was so noisy as to make normal conversation impossible. We were forced to alternate between shouting at our dining companions in an effort to make ourselves heard and nodding politely at their unintelligible answers. The main lodge and dining room. Room service – the rooms are serviced daily but don't expect meals or other refreshments to be delivered, nor is there a phone or intercom with which to contact reception. Come to think of it, there isn't an actual reception desk either. If you need the staff for any reason you have to go looking for them. Piping hot showers – the solar heating struggles, making open air showers in the, cooler than I expected, mornings something of a brisk affair. The trick, which we worked out on day 2 or 3, was to shower in the early afternoon while the sun is still strong. Surf the net or talk on your mobile phone – there is limited (very limited) wifi in the main lodge and none at all in the villas. There is no mobile phone reception. Swim in the surf – remember those saltwater crocs we saw on the river cruise. Swimming in either the ocean or the river is likely to be fatal - better too not to walk too close to the edge of the water. I should add there was a lovely looking pool which we didn't swim in. Pack a light jacket for the evenings. The days are warm but the evenings can be chilly. Pack a decent pair of walking/hiking shoes and comfortable shorts. Leave the high heels at home. You won't be able to wear them on the red-dirt roads which connect the villas to the main lodge. If you have mobility issues, ask for a villa close to the lodge. Pack an eye mask. The curtains don't even come close to keeping out the early morning sun. Alternatively you can embrace the dawn and enjoy the beautiful sunrise each morning. For my other Western Australian posts (Perth to Esperance) click - here. Note: David and I received a media discount during our stay at Berkeley River Lodge. All opinions are our own. I haven't been to the Kimberley yet. The landscape does look stunning. I guess you have to sacrifice a bit to get that desolation wilderness effect. Absolutely. It wouldn't be the same if it was too easy. The gorges of the Kimberley were the main things I wanted to see. I loved them. 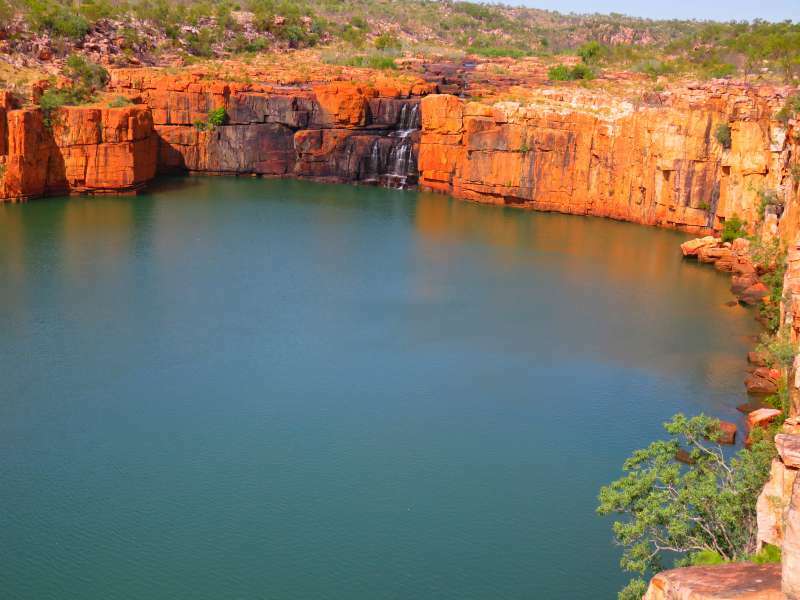 There are very few ways to see the Kimberley without camping. This was one of them so it was worth putting up with a few less than perfect things. The villas were amazing given how remote the location is - much more luxurious than many of the hotels we have stayed in in more accessible places. I was just blown away by the rock art. I would love to go back and do nothing but search out the art. There may be so much more which has not yet been discovered. Beautiful photos! Looks like a place I need to add to my list! 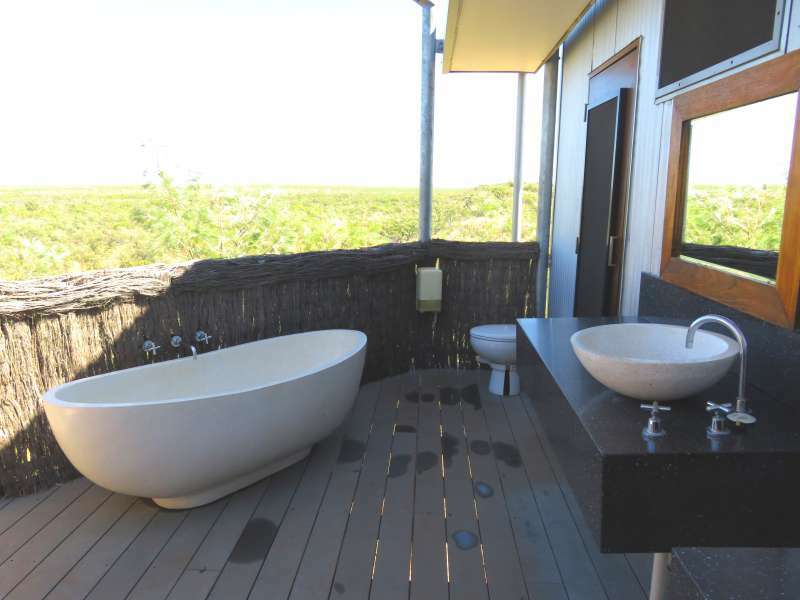 And that outdoor bathtub!! Oh my! Haha - I didn't try the bathtub but the shower was great fun. I did ask whether they had lost any guests to the crocs, and the answer was 'no' - at least that was their story and they were sticking to it - lol! I couldn't agree more about the beautiful landscapes. The more I see of Australia, the more I wonder why we ever bother going overseas to see things. THis lloks like some serious getting away from it all! I can believe how stunning it is. 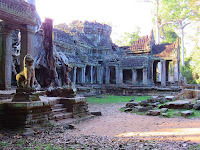 Thanks for linking up this week with #wkendtravelinspiration! Australia, particularly Western Australia has some of the most striking landscapes I have ever seen. Sounds like a mixed bag as far as lodging but that gorge makes it worth visiting. So much to see in Australia. I would go there again in an instant just for the scenery. We shared that bathroom with a couple of cute little frogs who also seemed to love it - lol! We only did a few kilometres of the Gibb River Road because David refuses to camp but we did stay at El Questro Station which is at one end and where lots of Gibb River Roaders (is that a word - lol!) stay. The thing that surprised me, especially when compared with the Berkeley River, was just how many people seemed to be travelling the road. It seems to have become a right of passage for retirees in Australia. Love this and all your western Australia articles. It is a part of the world I have not yet visited and actually really want to. Western Australia requires more planning that most destinations simply because so much of it is very remote - but it is worth the effort. Keep watching my blog because we are headed back to W.A in August to explore the Coral Coast north of Perth. I can't believe as a West Australian I have never heard of this lodge. Although I do know of Casurina Falls. Pitty they haven't thought to add some soloar lights along the road edge for walking back at night. The lodge has recently changed hands. Previously it was very much under the radar, however the new owners seem to be advertising it quite heavily. While we booked a long time ago under the old management, most of the guests who were there at the same time as us had come on deals promoted by the new management. of experiences. Thx for sharing yours in West Australia. We have some pretty good chocolate shops too - lol! I was just blown away by the Bradshaw Art. I had never heard of it before and it was just incredible to be standing in front of something which might be the oldest prehistoric art in existence. As you might have guessed, I didn't enjoy the dinners but everything else was so good I would go back in an instant. Wow that sounds like quite an adventure. I'm blown away by the beautiful scenery. I feel like Australia has so much to see, even if you lived there, you would never be able to see it all. You are right, Australia has so many stunning places even those of us who live here struggle to see it all. 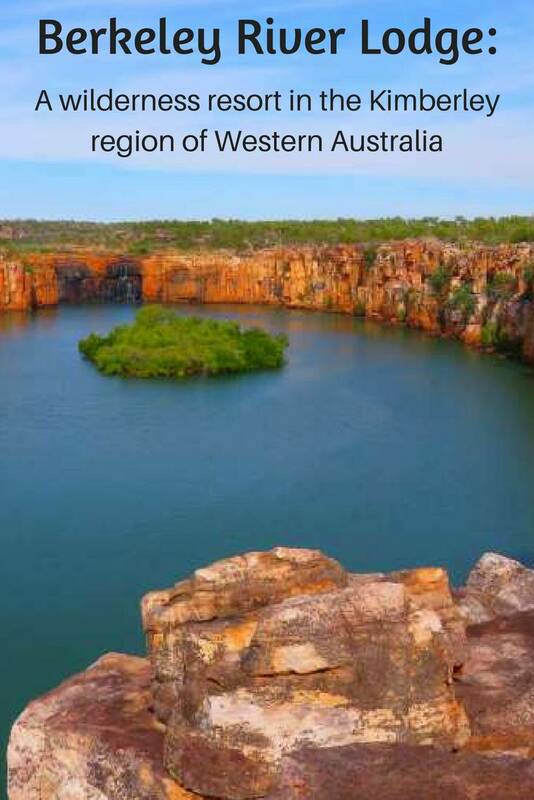 The Kimberley region is one of the most remote corners of the continent. I'm interested in anything Berkeley, and the Berkeley River and its lodge in Australia sound like a fine destination to add to my travel list! Haha - I forgot that your blog had the name 'Berkeley' in its title. I think that settles it, you just have to go to Berkeley River Lodge one day. Looks spectacular, love the outdoor bathroom! Have only been to the Kimberley briefly, on a trip up from Broome, but hope to go back and explore this area in more detail. The Kimberley more or less stretches from Broome on the west coast of Western Australia to Kununurra near the border with the Northern Territory. We spent a few days in Broome but most of our time was spent at the Kununurra end. Berkeley River Lodge sounds amazing. I have yet to travel to Australia. 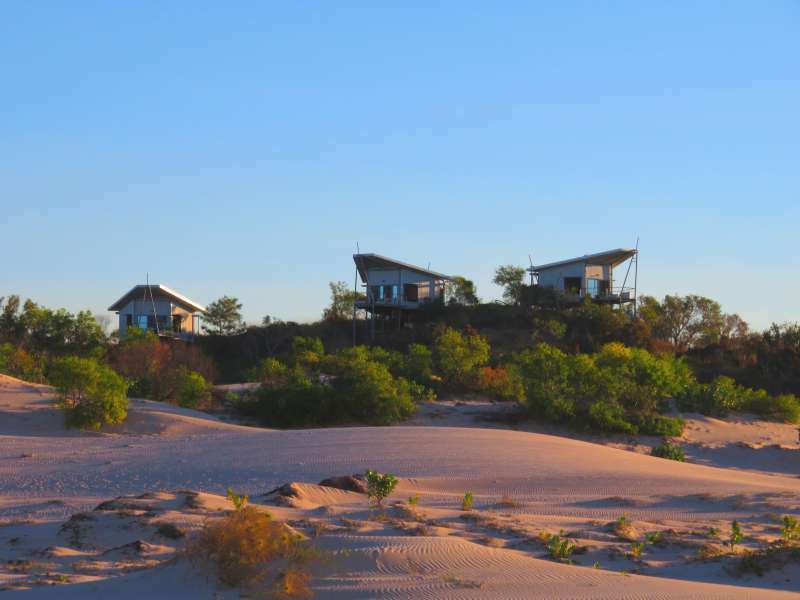 I am adding the lodge and Kimberley, Western Australia to my dream-list of what to see! The Kimberley is very remote. It is in the far north-west corner of Western Australia - very few roads, many of those unsealed and suitable for serious 4WDs only, not many towns and basically a whole lot of nothing interspersed with some of the most spectacular scenery you are ever likely to see. I highly recommend it but it does require a fair bit of forward planning and you have to go in the dry season. During the wet much of it is inaccessible. The outdoor bathroom was lots of fun, if a bit chilly at times. The natural landscape is nothing short of spectacular. Your travels to the Berkeley River Lodge and the surrounding area would have been a perfect 10 had it not been for the noise at dinnertime. The Kimberly region is really beautiful and I love seeing rock art. Amazing that there are no roads to this area.....but a great way to keep it "wild". Enjoyed your write-up. Am now wondering if I would like the toilet to be outside!! I don't think the lack of roads is a deliberate attempt to keep it 'wild,' although it has that effect. I think it is more to do with the fact that the population of this part of Australia is very small. This is harsh and unforgiving country, suitable for cattle stations the size of European countries, and not much else - except of course seeing the spectacular scenery. Wow - those views of and around the Gorge are fantastic! We really like the look of the resort rooms, too, but aren't too sure about the outdoor bathrooms. Although, watching the sunset from the tub sounds relaxing! Not due we'll get up to the Kimberley on our first trip to Australia, but we love seeing it through your photos! Thanks for sharing them on #TheWeeklyPostcard. The Kimberley is seriously remote. I doubt that most first time tourists make it that far but in my view it is absolutely the most stunning part of the country. It's funny how, in so many countries, some of the most stunning vistas are the most remote. Cruel irony, eh? It is ironic I suppose but maybe that is what makes them so lovely. I have been wanting to go to the Kimberlys for quite some time! This place looks absolutely amazing. I love that there is no reception and crocks every where haha! I have a friend there offering helicopter rides for tourists and some of the photos I have seen just blow me away. Mind you, your gallery is spectacular too! If you get a chance you should go. There are a lot of promotions on now so you might get a deal. The Kimberley region is stunning. I loved every minute of it. We did a helicopter ride near Kununurra but not one at Berkeley River. The Berkeley River one was nearly $1,000 each and I just felt that we couldn't justify that kind of cost. Other people who did it said it was really good though. Haha - I loved the Kimberley. It is the most stunning landscape I have ever seen. David was slightly less enthusiastic but he loved the Creel Walk and later on when we visited the gorges near Kununurra. David's problem is that he only likes pretty countryside whereas I love the dramatic. The Gorge is fantastic! And I love to see the crocs..from afar :). The lodge looks comfy as well.. The gorge was fabulous. We loved it.